Film and extras review by Dan Heaton. The recent television landscape includes numerous reality series of widely divergent quality and scope. Such popular staples as Survivor and The Real World continue to depict at least basically "regular" people living their lives in unique situations. Lower-scale productions like The Surreal Life and Beauty and The Geek are more exploitive and showcase has-been actors and wannabe stars making fools of themselves. The general public's acceptance and enjoyment of these reality series has changed the entire balance of television. While these series have become familiar, they barely existed in 1998, when a clever film presented the disturbing possibilities of the medium. The Truman Show depicts the everyday life of regular guy Truman Burbank (Jim Carrey) in the squeaky-clean town of Seaside. Everyone does seem a bit too nice and square, but his life appears happy and full of promise. Truman's wife is the unbelievably perky and product-obsessed Meryl (Laura Linney), whose resemblance to June Cleaver is more than just coincidental. His lifelong best friend Marlon (Noah Emmerich) stocks vending machines for a living and is always ready to arrive with a trusty sixpack when any trouble ensues. Truman ventures to his job as an insurance salesman and encounters the quirky local denizens that are commonplace in Hollywood films. Something is definitely amiss in Seaside, and strange events begin to raise suspicions in Truman's mind about this life. Has he simply become bored and paranoid, or is a more sinister conspiracy in place? If you've never read an article or seen a preview for this film, you should cease your reading immediately. The major hook of this film was unfortunately revealed everywhere during its original release, which does slightly lessen its initial impact. Truman is the unwillingly participant in a massive television series that revolves completely around every aspect of his life. Meryl, Marlon, and all the town's residents are actors involved in presenting an entertaining show 24 hours a day. Millions of viewers tune in worldwide to a show that is entirely fabricated with one exception�Truman has no idea that his world is not genuine. Seaside is one gigantic soundstage controlled from a command center overlooking the entire structure. Its supreme leader is Christof (Ed Harris), the self-described "creator," who has basically raised Truman by crafting his complete environment. He is not an evil man, but his Orwellian justifications for generating this deception reveal an extremely misguided individual. Prior to this role, Jim Carrey's primary credits were over-the-top comic performances while starring in the Ace Ventura films, The Mask, Dumb and Dumber, and Liar Liar. This picture marks his first major dramatic role in a feature film, and Carrey succeeds beyond any expectations. Truman still utilizes some energetic mannerisms common to the actor, but he also requires a greater range than in past roles. Carrey's final scene showcases a surprising emotional depth that would assist him greatly in his success with Eternal Sunshine of the Spotless Mind. Truman's longing for his lost love Sylvia (Natasha McElhone) is believable and very touching. This picture showcases his remarkable talent that stretches beyond the silly comic gag. Harris and Linney also perform well in roles that could have veered easily towards caricatures, and Emmerich perfectly plays an actor trying to be the typical movie sidekick. The Truman Show also succeeds due to the skills of director Peter Weir (Master and Commander, Witness), who has the rare ability to craft films with a mass appeal that also thrive artistically. Working from a compelling script from writer Andrew Nicol (Gattaca), Weir delivers an intelligent and enjoyable movie. Truman's plight is interesting for a wide audience, but it also raises questions about the nature our current state of reality entertainment. With Christof types and greedy executives gaining more power by the minute, it is only a matter of time before we have our own real-life version of this tale. Image Transfer Review: Truman Burbank makes his Blu-ray debut courtesy of Paramount high definition. While I'll admit to being disappointed with some of their catalogue titles this year (thanks to excessive amounts of DNR), I'd like to believe they've learned their lesson. For the most part, The Truman Show looks very good. Contrast is sharp amongst the film's vibrant color palette. Blacks are strong and rich throughout, while fleshtones remain natural (no waxy heads here). There is an occasional over-processing applied to some of the close-ups; I hesitate to say film grain has been removed (especially since it's prevalent in several instances), but this is enough to create a minor distraction. Lastly, the film's age is shown here with a print littered with minor specs of dirt. No biggie, but it's there. Overall I find myself very satisfied with Paramount's Blu-ray transfer, despite the hiccups. If you're looking to replace your previous SD purchase, this gets a confident recommendation. 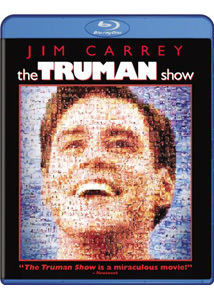 Audio Transfer Review: While primarily a dialogue-heavy film, The Truman Show makes effective use of those home theater setups. Rear-channels are put to good use during the most dramatic bits (especially the climax), while the main channels host the dialogue, which is crystal clear, never overshadowed by sound effects or music. This True HD track is more satisfying and busier than expected. This two-part, 40-minute documentary serves as the primary feature on this release and offers a solid overview of the production. The first part conveys the story's origin and the opinions of the primary cast and crew. Peter Weir provides plenty of compelling material about the changes that he placed into Andrew Nicol's insightful script. The second half covers the difficulties and finding the right location and dealing with the mayor of Seaside, Florida. It also provides details on the last-minute casting of Ed Harris due to troubles with another actor (Dennis Hopper according to the Internet Movie Database.) Harris was hired on Friday and started shooting the following week, which makes his overwhelming success with the character even more impressive. Visual effects supervisor Craig Barron (The Ring) discusses the hyperrealism of film's digital effects in this informative feature. The 13-minute piece depicts the way that the effects served the story and did not interfere with Truman's plight. These four excised scenes run for about 13 minutes and include some noteworthy moments. "Product Placement" is an extended scene that provides many more commercials from Linney and additional shots of Jim Carrey acting silly. "Truman Suspicious" is also a longer version and shows Truman wondering about strange happenings within the town. "The Future Cast Meeting" is entirely new and shows an intriguing scene of the main actors discussing the show's upcoming ideas. "Truman Missing" depicts everyone looking for Truman and him arriving on the boat near the conclusion. This collection of 42 color photos includes pictures of behind-the-scenes sets, the actors, and moments from the finished movie. Peter Weir appears in a surprising number of photos looking through his lens and sometimes just standing around. The 90-second teaser trailer utilizes the "fake commercial" idea to present the film's premise without revealing too many of the story's events. On the other hand, the 150-second theatrical trailer gives away far too much and transforms the picture into a more lighthearted tale. The two television spots run for 30 seconds and mostly showcase Jim Carrey acting silly. The Truman Show is much more than just another Jim Carrey vehicle. Directed effectively by Peter Weir, it depicts a world where the need for entertainment has overwhelmed the moral quandary of controlling every aspect of another human being's life. While our culture has not reached this point yet, we appear headed on a slow, steady course toward this disturbing destination. Offering high entertainment value and a thought-provoking premise, this picture is highly recommended.